Last week, skywatchers all over the world were treated to one of the best Geminid meteor showers in recent memory. Because this year's shower peaked during a new moon, leaving the sky as dark as possible, it brought some viewers in rural areas between 50 and 100 meteors per hour. "There was great weather in Freeland, Md.," SPACE.com reader Mike Hankey wrote in an email, "and I was seeing two to three meteors per minute between the hours of one and four. They often came in spurts with three or four in a row and then none for a few minutes, then a few more." But just in case you missed the show, some of the best footage from the shower is now online. The second video, shot from Tenerife, the main island of the Canaries off the coast of Africa, was shot by Roberto Porto, a veteran meteor shower videographer. Porto combined time-lapse footage of the Geminid shower from 2012 with still shots of the show from 2011, seen at the end of the video. Some SPACE.com readers even got in on the astrophotography action by pointing their own cameras to the sky. 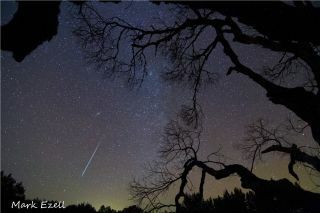 "I literally have a meteor shower of Geminid pics, I captured so many," Mark Ezell told SPACE. "It was like fishing in a bathtub. What a treat." Each year, around mid-December, Earth passes through a trail of debris left behind by asteroid 3200 Phaethon. This interception shoots tiny particles into the atmosphere and gives onlookers the usually impressive shower known as the Geminids. The shower is named for the constellation Gemini (The Twins) because most of the meteors seem to originate from the constellation's two brightest stars: Pollux and Castor. And if you missed this year's Geminids, not to worry: Another meteor shower, the Ursids, is gearing up to peak this Saturday (Dec. 22), and should offer another great show.